This is the latest book by Dav Pilkey, known for his Captain Underpants books. 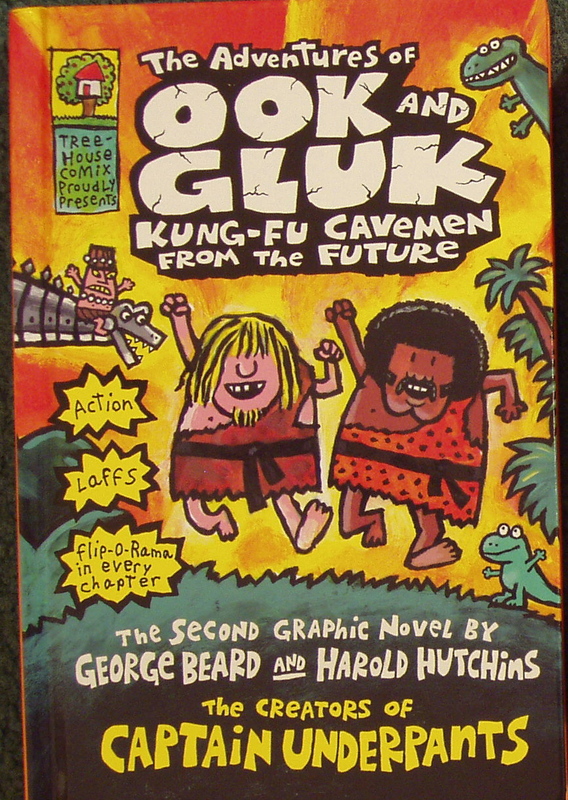 In this all new graphic novel, George Beard and Harold Hutchins present the sensational saga of two silly caveboys names Ook and Gluk (Ook rhymes with "kook", and Gluk rhymes with "Truck"). 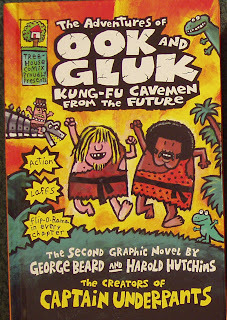 Ook and Gluk have a pretty awesome life growing up together in Caveland, Ohio, in 500,001 BC - even though they're always getting in trouble with their evil leader, Big Chief Goppernopper. But Ook and Gluk's groovy lives take a turn for the terrible when an evil corporation from the future invades their quiet, prehistoric town. When Ook, Gluk, and their little dinosaur pal, Lily, are pulled through a time portal to the year 2222 AD, they discover that the world of the future is even worse than the devastated one they came from. Fortunately, they find a friend in Master Wong, a martial arts instructor who trains them in the ways of kung fu, so that they may one day return home and make things right again. But when their time of destiny arrives, will they have what it takes to defeat kill robots, mecha dinosaurs, and time-traveling terrorists? I gave a copy of this to my nine year old nephew for Christmas. I did not read the book, so can't comment on the contents, story nor writing style. I can tell you that he loves the book. He dropped the toy I also gave him and commenced to read the book. He wandered around the room, book in hand, and would stop at any adult or sibling and say "Here, look at this," and then insist we do as told. This went on till he finished the book and then started again. Yes, he ignored new toys in favour of a book. I think that is all the review needed. I won this book in a contest hosted by Mel at He Followed Me Home.....Can I keep Him? and sponsored by Scholastic Canada. You can read Mel and her son Jake's review here. What better review for a book than someone whether child or adult, that not only won't,put the book down, but insist on converting everyone else to its delights. What more could you ask for in a book than it gives the person who received it joy. And when it a child all the better. I know my son adored the Captain Underpants books. Hurray, for giving books for Christmas. I love your story about this book! :-) Sounds like a good one for my nephew, same age. We gave him the first Lunchlady book and he loved that one.